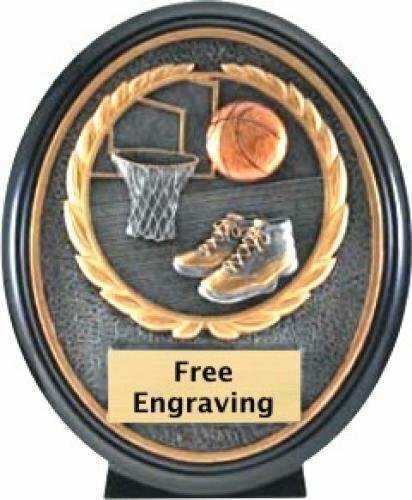 Basketball trophies, medals and plaques are used to celebrate and commemorate a fun basketball season. This category includes a great selection of basketball awards as well. 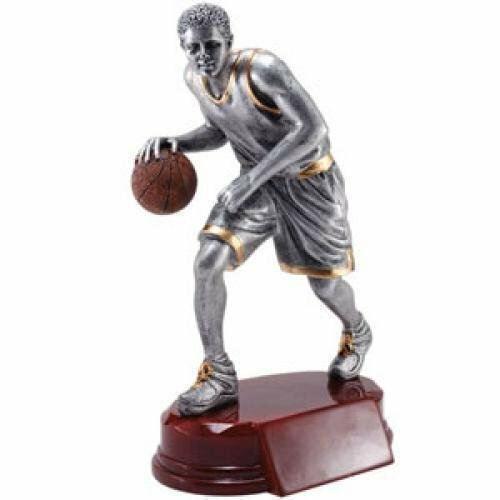 Whether you need an economy trophy or a more elaborate basketball award, you are sure to find the perfect basketball trophy here. FREE Shipping on orders over $100. FREE Engraving. This is a great choice for an economy basketball trophy. Choose a cheap basketball trophy for your team or tournament trophy event. 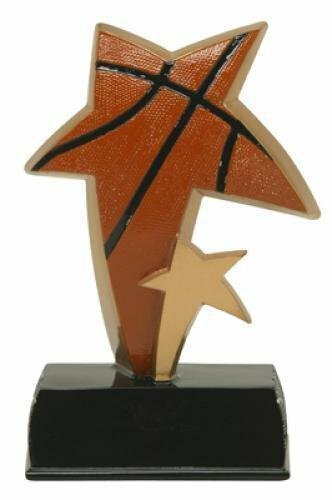 FREE Shipping is available on orders cheap basketball trophies over $100. FREE Engraving. 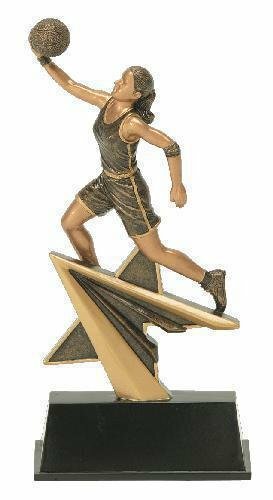 This elegant Star Power Basketball Female Award combines the icon of a star and basketball player in a rich black and gold tone finish. The basketball player is shown with the ball in her hand, raised in the air, while appearing to soar through the air to make the game winning shot. Great flexibility is provided with these awards as they are available in male and female versions and are 7" in height. The base on these awards provide plenty of room for whatever your personalization needs may be. These basketball awards are sure to be a bring smiles to you next awards ceremony! This elegant Star Power Basketball Male Award combines a the icon of a star and basketball player in a rich black and gold tone finish. The basketball player is shown with the ball in his hand, raised in the air, while appearing to soar through the air to make the game winning slam dunk. Great flexibility is provided with these awards as they are available in male and female versions and are 7" in height. The base on these awards provide plenty of room for whatever your personalization needs may be. These basketball awards are sure to be a bring smiles to you next awards ceremony! The Basketball Ebony resin trophy has a brushed gold laser engraved plate and black letters. 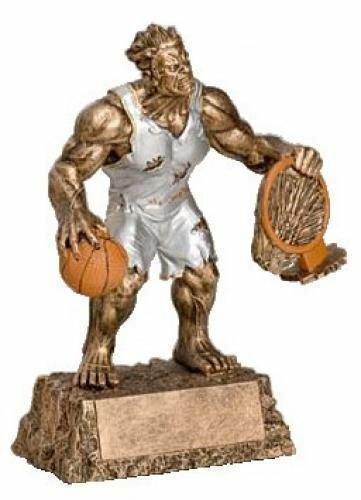 The Monster Basketball resin trophy has big muscles and intense expression. Kids will love it or be scared of it. So be sure to ask your parents how their child will respond before ordering. It comes with a brushed gold plate with black laser engraved letters. Need an economy basketball championship trophy? Whether you call it a large trophy, tall trophy, big trophy, 2 column trophy or 2 post trophy, you are sure to find a wide selection of championship trophies here. These large trophies make great basketball awards. The big trophies, also known as 2 post trophies or 2 column trophies, have a lot of character. For tall trophies, these basketball trophies are economically priced. The basketball award is available in several sizes. When you specify the height of the basketball trophy, the columns will be increased as needed. Free shipping is available on orders over $100. Free engraving is always included. This is a great choice for an economy basketball trophy. 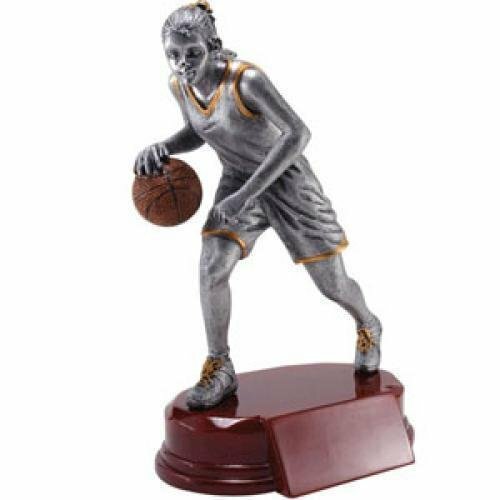 Choose a cheap basketball trophy for your team or tournament trophy event. Height Shown: 32" Available Heights: 29" - 33"
Need an imperial basketball championship trophy? Whether you call it a large trophy, tall trophy, big trophy, 2 column trophy or 2 post trophy, you are sure to find a wide selection of championship trophies here. These large trophies make great basketball awards. The big trophies, also known as 2 post trophies or 2 column trophies, have a lot of character. For tall trophies, these basketball trophies are economically priced. The basketball award is available in several sizes. When you specify the height of the basketball trophy, the columns will be increased as needed. Free shipping is available on orders over $100. Free engraving is always included. This is a great choice for an economy basketball trophy. 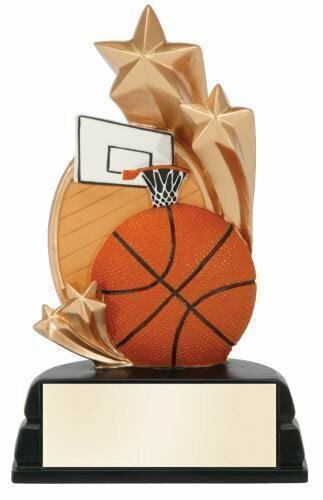 Choose a cheap basketball trophy for your team or tournament trophy event.